I really don’t know much about my grandfather Harry, and I don’t think my father knew a great deal about him either. For example, my Dad was unsure of his father’s middle name; he only knew that his middle initial was “L”. Harry himself listed his middle name as “Long” on his World War II draft card but it was “Leon” on my father’s birth certificate. Harry’s father died when he was not yet eight years old. His mother remarried and moved to New Mexico or California, but she did not take Harry or his sister Daisy with her. 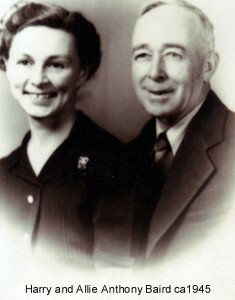 My father and Harry’s wife both had the somewhat vague impression that Harry and his sister Daisy may have lived with their Stewart grandparents for a short while after their father’s death. It must have been quite a short while, as both Harry and Daisy were in the household of their older sister, Effie Pemberton, for the 1900 census of Dallas. Two years later Effie Pemberton’s husband divorced her on the grounds of her “adultery and prostitution” and the couple separated. It’s not clear where Harry spent the rest of his childhood, but later census records indicate that he managed to attend school through the eighth grade. In the 1910 census he was a 22-year old telephone lineman living in a Pittsburg, Camp County, Texas boardinghouse. According to my father, Harry worked throughout northeastern Texas and. at some point he worked for the Red Hook Telephone Company in Morris County where Allie Anthony was a telephone operator. 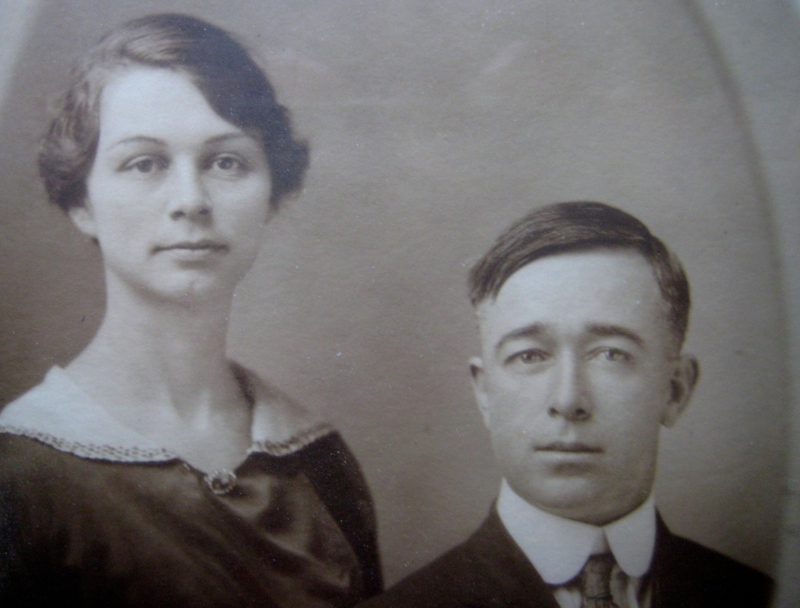 Harry had just passed his 28th birthday when he married 17-year old Allie Anthony on 21 February 1915, in Omaha, Morris County, Texas. Allie told me that they lived for a time with her parents. But Harry’s World War I draft registration card, dated 5 June 1917, gives his address as Wolfe City, Texas and his occupation as a manager at Southwestern Telephone. They were still there for the 1920 census which shows them living on Preston Street in Wolfe City (which was located northwest of Commerce in Hunt County) when Harry listed his occupation as a worker in a flour mill. 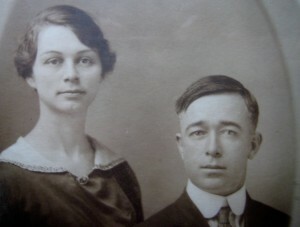 They moved back to Omaha to live with her parents before my father was born in 1921. My father, their only child, was born in 1921 in the Allie’s parent’s house on South Main Street, and was delivered by his her father Dr. Edward Young Anthony. Harry and Allie continued to live with her parents for the rest of their lives, and both died in that house. The 1930 census listed Harry as a house painter and the 1940 census listed him as an electrician who “works at home”. According to my mother, by 1940 Harry had quit working and started repairing small appliances in the dirt-floored basement of the Anthony house. He also did odd jobs – his death certificate listed his occupation as “painter”. He much preferred hunting and fishing to working, and apparently was content to live with the Anthonys and work part time, if at all. He also taught himself to play the violin and joined a local band. Allie gave piano lessons and played at the Baptist church. I have several photographs of the two of them taken in the 1920s through the early 1940s. Harry died of “a heart ailment” on Christmas Eve 1945. I don’t remember it, but my parents packed up our pre-war sedan and drove from Washington, D.C. to Texas for the funeral at the Omaha Baptist Church. He was buried in the Omaha Cemetery. Dr. Edward Young Anthony died a month later. Allie and her mother continued living together in the Anthony house for the next few decades. I remember spending nearly every summer with them through the late 1950s. Allie remarried to a longtime neighbor named Corry Wright, but remained in her mother’s house. Her mother died there in 1969 and Allie in 1977. Both Harry and his wife are buried in the Omaha City Cemetery.